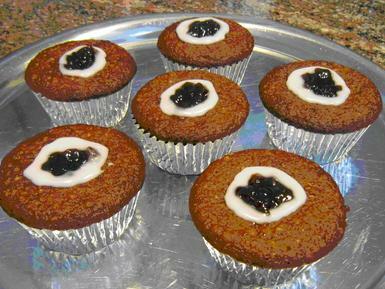 To celebrate Runeberg* enjoy Runeberg Cakes (Runebergin tortut). Recipe adapted by Kirsti Langbein, Finnish Translator and Interpreter (contact info), from various sources. The Runeberg Cakes are easy to make, and they go perfectly with tea or coffee. Runeberg apparently had them for breakfast after a night out. * Johan Ludvig Runeberg, one of Finland�s greatest men, was known throughout Scandinavia as a poet, teacher & statesman. The ideals portrayed by Runeberg, to a great extent, formed the foundation for this organization, which bears his name. Beat 3 first ingredients well, add yogurt and beat well. Mix all dry ingredients together and add to the first mixture. Divide into 8 muffin tins. Bake at 400 f for 18-20 min. Put a dollop of raspberry jam in the middle of each. Let cool. Mix 1 dl of powdered sugar with a teaspoon or two of water to make a paste. Decorate the cakes with the paste by forming a ring around the raspberry jam. Vatkaa margariini, oljy, sokeri ja muna vaahdoksi monitoimikoneessa tai sahkovatkaimella. Lisaa jugurtti ja vatkaa hyvin. Sekoita kaikki kuivat aineet keskenaan ja lisaa seos rasvaseokseen. Sekoita hellavaroin. Jaa 8 muffinssivuokaan. Paista 400 F:ssa 18-20 min. Pane vadelmahillonokare jokaisen keskelle. Anna jaahtya. Sekoita 1 dl puuterisokeria ja noin 1-2 tl vetta tahnaksi. Koristele renkaalla hillon ympari.